Take 10 watches which make the mark. Another epic week ends. The mood was cautious this year at the Salon International de Haute Horlogerie in Geneva. The watches being presented were magnificently beautiful, but with a decidedly more commercial flavour. Prices seem to head toward more modest levels. And many entry level watches are being shown. Here is the Chief Editor’s Choice for SIHH 2017: Ten of the best which caught his eye. A serious collector friend observed of the asking prices this SIHH 2017. With this as a preamble, we begin with the Chief’s selection. Presented in alphabetical order, as no other order or preference is implied. Detailed reviews of each of these picks will follow, with our usual high resolution photographs and hands-on analysis. If the mood was cautious all over the fair, it was sober at Lange. On Tuesday morning, the day after the SIHH 2017 opened,Walter Lange passed away peacefully after a short illness. He was the great grandson of F. A. Lange, who founded A. Lange & Söhne in 1845. We carried a In Memoriam message the same morning with personal anecdotes. Read that here. Product wise, like most years, Lange announced a list of novelties. The big talking piece of the show was the new Tourbograph Perpetual Calendar “Pour le Mérite”. The Tourbograph was one of the milestone grand complication watches that Lange launched in 2005 as a 51 piece limited edition in platinum. In 2010, a further 50 pieces were added to total 101 pieces in honey coloured gold. For 2017, a perpetual calendar module was added under the dial, and the new Tourbograph was born. This watch was on Frank’s picks from the SIHH. But the one which caught the Chief’s eye was the rather less assuming, but perhaps louder (literally speaking) Zeitwerk Decimal Striking Time. 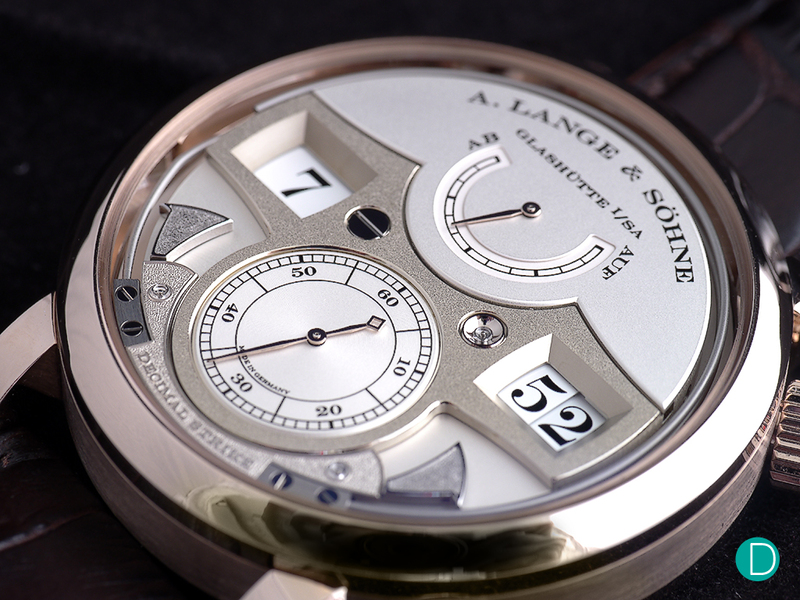 The Lange Zeitwerk Decimal Striking Time features tremblage work on the Time Bridge. This is an extension to the regular Zeitwerk Striking Time, which we covered in detail here and here. The difference in this new release is the tremblage work on the Time Bridge, the striking hammers and the hammer bridge. Prior to this, Lange had reserved the tremblage, a tedious hand working method of individually indenting each mark on the polished surface, only to their Handswerkskundst special edition watches. And though this new Zeitwerk Decimal Striking Time is not designated Handswerkskundst, it gets this special treatment. The technical feat of converting the Striking Time to Decimal Striking Time is easily under-estimated by the uninitiated observer. But converting an existing mechanism which strikes 4 times an hour to one striking 6 times an hour is a study of conservation of power within the movement. The movement remains the same dimension, uses the same mainspring as the original Striking Time, but by optimising the power use within movement, Lange watchmakers was able to extend the striking power by 50%. Interesting feat. Retail price is set at € 120,000, against the original Striking Time in platinum of € 100,400 at release time in 2011. Girard Perregaux returns to the SIHH this year after a hiatus of several years exhibiting only at Baselworld. The novelties feature a kind of return to basics, emphasizing on a relaunch of their Laureato collection – a collection of sporty watches with the signature octagonal bezel (yes, similar to the Genta designs at Audemars Piguet and Patek Philipppe, but this was an original design from 1975, and unlike the others was initially launched with a quartz movement). We first saw the rebirth of the Laureato line in 2016, when GP released a special edition: the Laureato 225 Anniversary Edition. But they have gone in a big way for 2017, increasing the collection with numerous watches and with three sizes…S, M, L in 34mm with a quartz movement, and in 38mm and 42mm with an automatic movement. Among the many Laureto novelties, we were persuaded by the flagship Tourbillon. 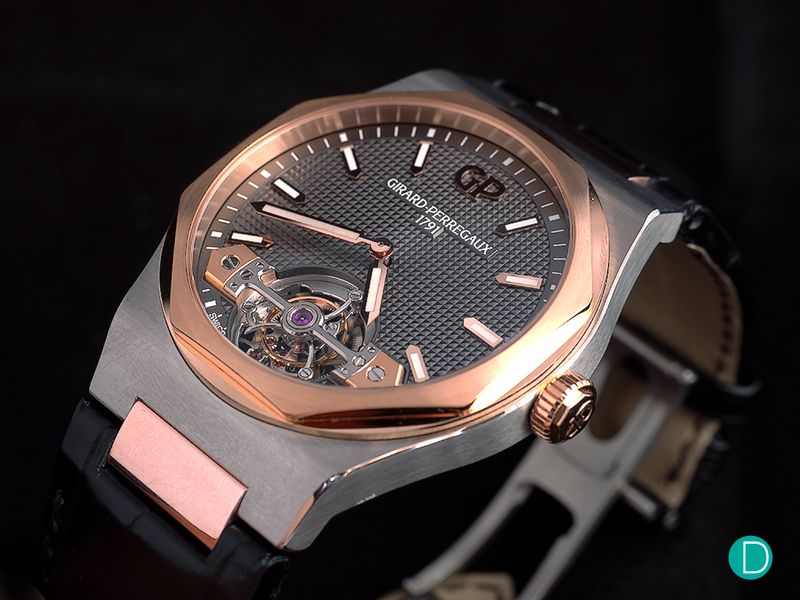 The GP Lauteato Tourbillon is presented in a two tone case of titanium and rose gold. We pick the top of the line Laureato Tourbillon as our Editor’s Choice. The watch is presented with the said bezel, a Clous de Paris guilloché on the dial, an Italian design in a two tone design with either titanium with pink gold or titanium with white gold. The case is 45mm (perhaps XL? ), and features the GP Tourbillon in a single golden bridge, and a micro rotor. Priced at CHF 95,400, it is one of the camp of more sober pricing. A watch like this released 5 years ago would probably carry a price tag double this. Another re-launch, the Da Vinci returns to the IWC collection. Often the underappreciated the Da Vinci line was first presented in 1985 with the Ref. 3750, when the author was just about to start his watch collecting career . An amazing watch in the day. A chronograph as the base with an innovative perpetual calendar with a four digit year display created by the now famous Kurt Klaus. The design was quirky, with a lug design which took quite a bit to get used to. But the innovation was clear. The Da Vinci got a design update in 2007, with a new case shape – a tonneau. By then, it was the era of the Great Price Expansion, and it was no longer offered as a modestly priced perpetual calendar chronograph, with the Ref. 3762. It was also often criticized for being very chunky and only suitable for big wrists. As a result the Da Vinci as a collection, was overlooked for her prettier and glamourous sisters – the Portugeiser and Portofino collection. 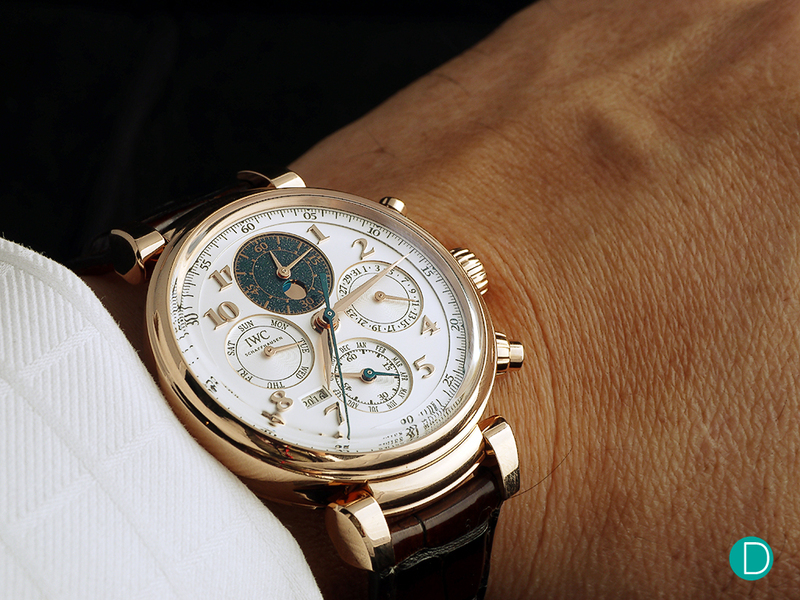 The IWC Da Vinci Perpetual Chronograph is the iconic model in the collection. But for 2017, the Da Vinci collection was completely re-designed. Most of the collection are at entry level, with the range topping out with the Tourbillon. The new Ref. 392101 is the iconic replacement for the Chronograph Perpetual Calendar, and decidedly mid-priced.. Now look is sexier with a round case shape with articulating lugs inspired by the original lugs, but now not quirky and thoroughly modern. And sporting an in-house developed movement C. 89630 with a column wheel controlled flyback chronograph and totally new perpetual calendar plate but keeping the original layout of 1985. The moonphase display now features a new system with a 1 day out of 570 years accuracy instead of the regular 1 day out of every 122 years. In our detailed review we will publish the S$ retail prices, but the Swiss Retail for the new Da Vinci Perpetual Calendar Chronograph is a modest CHF 32,000 in stainless steel, and CHF 43,000 in red gold, both ex-taxes. We come now to Jaeger LeCoultre, a grande dame brand which we respect very much for its in-house production capabilities as much as for the often gorgeous designs. This year, JLC has focussed the 2017 collection on two fronts. One which is the talking piece of the tourbillon equipped Geophysic Universal Time, and the other dedicated to extending the already very strong ladies line. 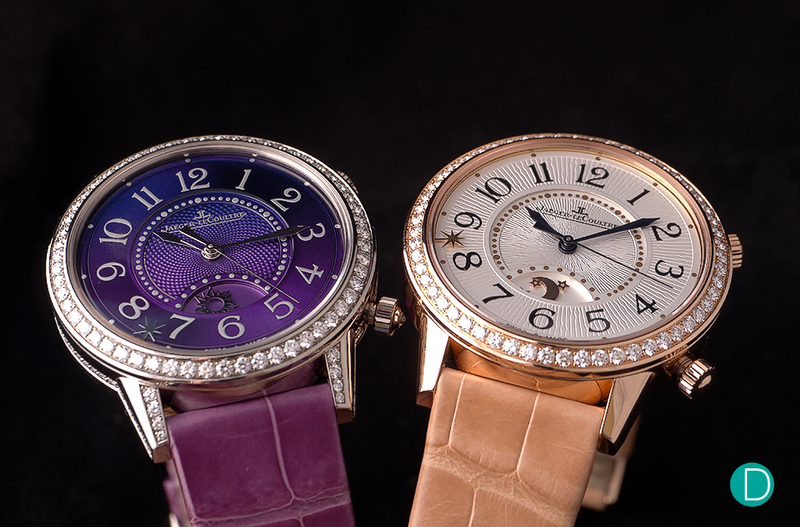 The JLC Rendezvous collection provides the complicated mechanical watches to ladies while maintaining the feminine feel. We pick the Rendezvous Sonatina for Editor’s Choice. The Rendezvous line, as the name suggests is for the lady who has an meeting to get to…a rendezvous. The collection has always featured gorgeous designs. We covered them here and here, always with a touch of mechanical complication to an otherwise beautiful feminine watch. The Sonatina is no different. It combines both the rendezvous aspect with a complication. An aural reminder function. Is this like the Memovox from JLC? Not quite. Instead of a long alarm of the Memovox, the Sonatina is much more discrete and lady-like, it just announces the rendezvous time with a polite but clear sounding delicate tinkle. What a fitting tribute to the Rendezvous concept. Retail price is S$ 59,500 (purple with white gold) S$ 42,500 (pink gold). For 2017, Montblanc released a slew of watches in the Timewalker collection, and the ever popular Bronze collection which we covered in our detailed hands-on review here. Almost of the Timewalker and novelties for 2017 are targeted close to the entry level. The watch which struck us technically was the Timewalker Chronograph 1000. It features an interesting concept. Measure the chronograph time to 1/1000th of a second. While we may argue the need for such precision, or even if it is possible, given that reaction times of humans operating the pushers are several magnitudes higher than that, we marvel at the technical solutions offered to resolve a chronograph to such a tiny time slice. 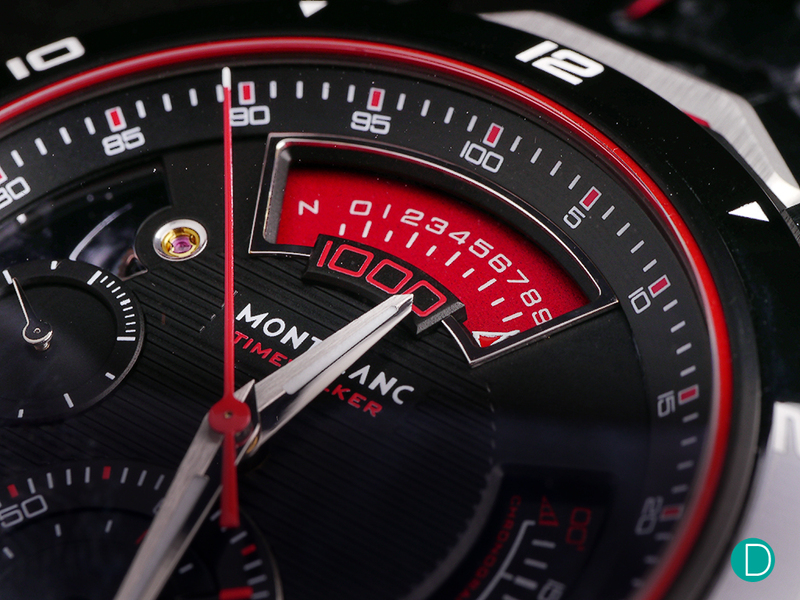 The vernier scale to show the reading up to 1/1000th of a second on the Montblanc Timewalker Chronograph 1000. Montblanc achieves this using a dual train system. One train running normally at 36,000 bph, and a second train, dedicated to the 1/1000th display running at 360,000 bph. Now the sharp reader would have noted that 360,000 bph is only capable to resolve to 1/100th of a second, but through a system of clever interpolation using both balances, it is mathematically possible, and indeed as Montblanc has shown in the Timewalker Chronograph 1000 to be practically possible, to give a system resolution capable of 1/1000th of a second. The display is also a model of design as it offers to be able to display this information intuitively and clearly. For this interesting innovation, and the opportunity for us to explore deeper into how this mechanical system works, we select this for our Editor’s Choice award. Details in the full review to come. The Montblanc Timewalker Chronograph 1000 is set at a retail price of € 175,000 inclusive of German taxes. For 2017, Parmigiani also joins the rest of the SIHH in announcing more modestly priced products. The line up for this year is quite long, ranging from the new Toric collection, to the Tonda line extensions, a new Bugatti collaboration piece, a new Kalpa and the extension of the Ovale line. For the longest time, the Toric collection was reserved for their ultra complicated watches like the Minute Repeaters and Tourbillons. These were magnificent watches, but priced above the half million Swiss Franc mark, often not within the reach of regular collectors. So the Chief was pleasantly surprised with the new Toric Chronometre, priced at a rather modest CHF 18,500 before taxes in either red gold or white gold. 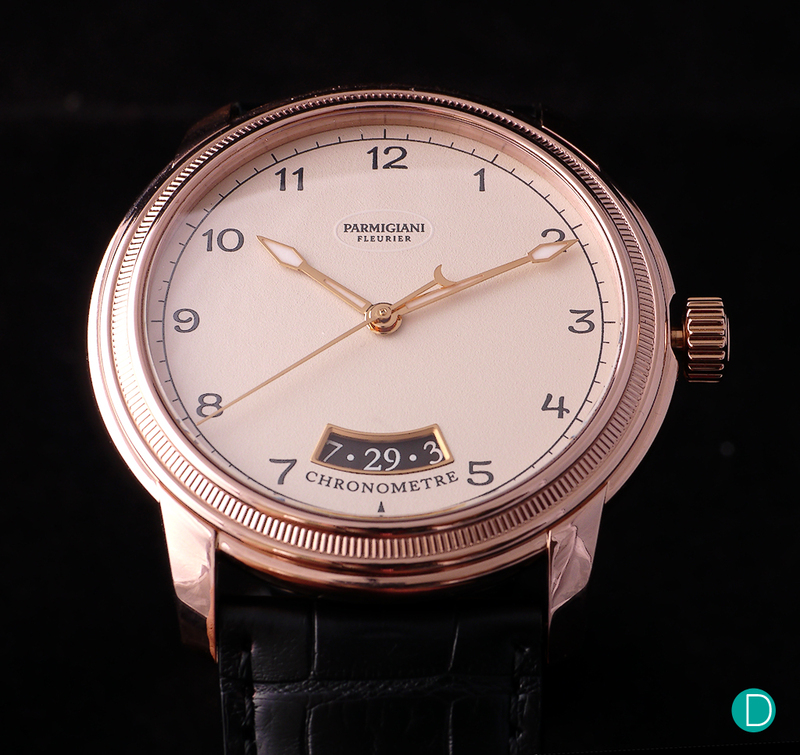 The Toric collection from Parmigiani were previously the sacred ground for their ultra complicated pieces, and for the first time reaches the levels of modest pricing. The case is one of the first designed by Michel Parmigiani, with the signature coin edge design on the bezel, also present in the tonneau shaped Iconica Hepdomadaire. The design is nspired by columns of Ancient Greece, with the patterns derived from gadroons and knurling. It comes with a redesigned case and curve lugs, as well as a new Arabic dial that comes in either black opaline or white grained version. Movement is the impressive in-house calibre PF331, the self-winding movement boasts a date indicator and a power reserve of around 55 hours. For 2017, Panerai only introduced watches to add to the Luminor line. No new Radiomirs were announced. The theme which was interesting to us, other than the dial variations to the Submersible, America’s Cup lines was the play with materials. In 2016, Panerai surprised us with the 3D printed movement by direct metal sintering in their PAM 578, and this year, the introduction of a new dial material remains central to the theme. The BMG-Tech model plays with a new alloy trademarked by Panerai. But the watch which captivated our attention is the LAB-ID. 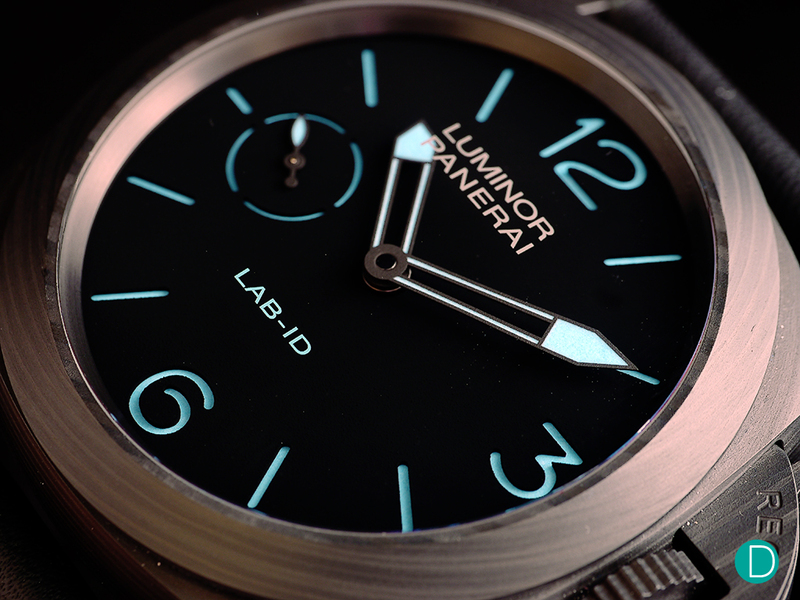 The dial of the Panerai PAM00700 uses two colors of SuperLuminova over an ultra black dial. The case on the LAB-ID is the Carbotech carbon case. Carbotech is not new to Panerai, we covered a full review of the first edition Panerai Carbotech here. But the material affords interesting and always unique patterns. And a carbon nanotube on the dial which Panerai claims to be the darkest dial ever made. Another independent brand, MCT made the same claim with a dial using Vantablack in their S110 Evo Vantablack. But Panerai officials refuted their claim saying that in their search for the darkest material, Panerai had examined the Vantablack material, but were not satisfied. Thus began to develop their own using a method of employing carbon nanotubes. Panerai claims their nanotube dial to be darker than Vantablack. The jury is out on this, as we have no way to measure the claims, but in our examination of the Panerai dial does confirm that it is indeed very dark…perhaps darker than any dial we have ever seen. And as shown above with using only standard SuperLuminova on the markers (in two colours), the lume is a standout. But more later in our Detailed Review. The PAM 00700 is not have an interesting dial and case, but also in the movement. The P.3001/C is made of carbon and is self lubricating. The most shocking, and interesting fact on the PAM00700 is that it is offered with a 50 year warranty. Yes, 50 years. Ten times that offered by Rolex and Ulysse Nardin. But only 50 pieces will be available at a retail price of € 50,000. We often overlook Richard Mille watches as high prized racing machines which are too expensive for most inhabitants of this planet. But, while they continue with the stratospheric prices, Richard Mille also continues to explore the use of interesting and new materials in their watches. For 2017, Richard Mille announced several watches were announced for SIHH, but interestingly the RM press machine only showed one watch in their Press Conference. The RM50-03. This one intrigues with the use of the latest darling material to hit the market. Graphene. The RM50-03 Split Seconds Chronograph is designed in the signature Richard Mille style – tonneau case, open worked dial, and an industrial finishing to the complex split seconds movement from APRP. Stunning design. Very eye catching. And a not atypical Mille claim: Lightest Split Seconds Chronograph ever. Total watch weight: 40g including strap. The movement alone weighs only 7g, just a bit more than the air weighs inside the case…though of course we jest. In our detailed review, we will discuss more about marvels of Graphene. The RM50-03 is the first watch to use this material, though it has been used in products as diverse as F1 cars (where the RM inspiration came from) and aerospace to more plebeian uses like in bicycle tyres (Vittoria has a line of Graphene tyres) and bicycle frames (the UK frame maker Dassi has their Interceptor made with Graphene). Interesting material. 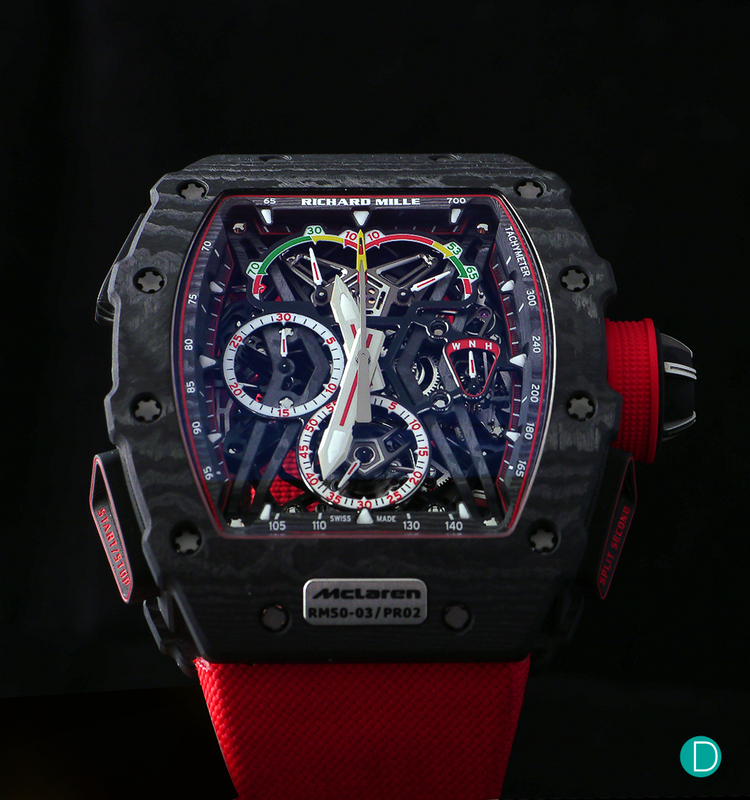 For the RM50-03, Richard Mille recommends a retail price of an eye watering CHF 980,000 before taxes. Ulysse Nardin explodes into SIHH with their first ever showing at the Salon in 2017 with a plethora of very interesting and non-wallet busting watches. 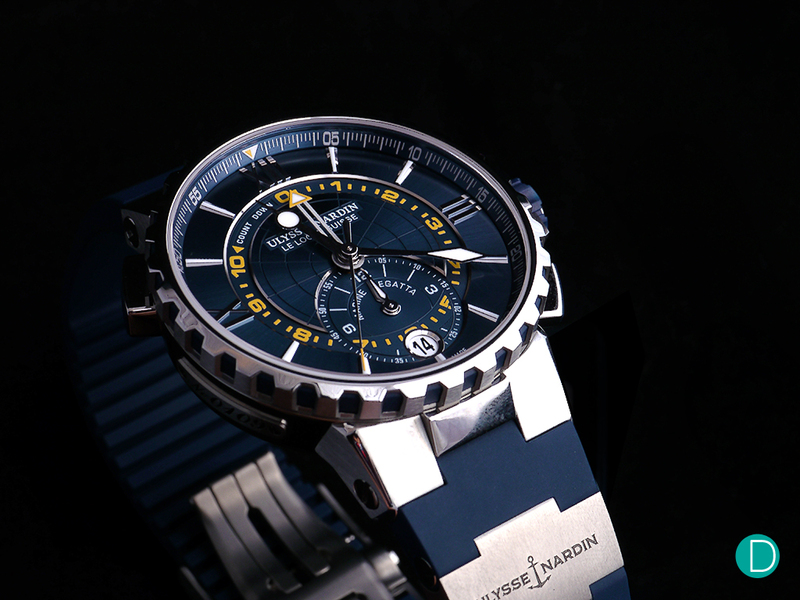 From the new Innovision Freak to the wonderful grande feu enamel watches to this amazing watch: the Marine Regatta. The UN Marine Regatta Chronograph shows the way for regatta watches. Designed with the aid of the UN Artemis Racing, it features an automatic start for the chronograph once the countdown ends. At first glance it looks like any other Regatta watch, though the UN design language and DNA is present. But the hidden detail is only apparent when using the Regatta function. As is typical in a Regatta watch, there is countdown function of up to 10 minutes. For the regular Regatta watch, at the end of the countdown, the user has to manually activate the chronograph to time the race. In the UN, this is done automatically without user intervention. Small innovation, and perhaps not technically ground shaking, but one with an attention to detail which can only come from working closely with the actual users of the watch and catering to the field needs rather than a watchmaker dreaming of what might be useful in the oceans…especially for a watchmaker in a land locked nation like Switzerland. For this alone Patrik Hoffmann and his team deserves a big thumbs up, and we chose this watch for our Editor’s Choice. Two versions will be available. A standard version retails for CHF 15,900 and a limited edition version with a black enamel dial for CHF 25,800. And last but certainly not least we come to Vacheron Constantin. VC this year has decided to base their novelties on two lines: an astronomic indications line and a striking line. These are derivative of the amazing C.57260 released two years ago, and the innovations which made its way into that movement is finally trickling down. The Executive Editor has already picked the Celestia for his Top 5, and the Chief picks the other astronomical piece – the Copernicus Celestial Spheres. The author is fascinated with Nicolas Copernicus his theory of heliocentrism, which states that the Earth spins on its axis and orbits around the Sun, contrary to the popular belief in his time. VC created a watch showing this astronomical displays in three styles of Métiers d’Art: via grand feu enamel, graveur and sapphire. The VC Copernicus Celestial Spheres is a collection of 3 watches executed in 3 different metiers d’art techniques. This one shown here is the Grand Feu enamel. VC’s Métiers d’Art works are always exceptional. Here they pit three of their showcase expertises to demonstrate the art on one movement. Each executed with aplomb. The one which attracted the author the most is the grand feu enamel version. A very realistic visual interpretation of the indications offered by the movement. In addition to the complicated movement with interesting display of the elliptical path of the Earth around the sun, with a depiction of the Earth spinning on its axis as well as orbiting the Sun. The accuracy of the mechanism has extreme accuracy, requiring only one correction every 8,000 years. All functions are adjusted via the crown. 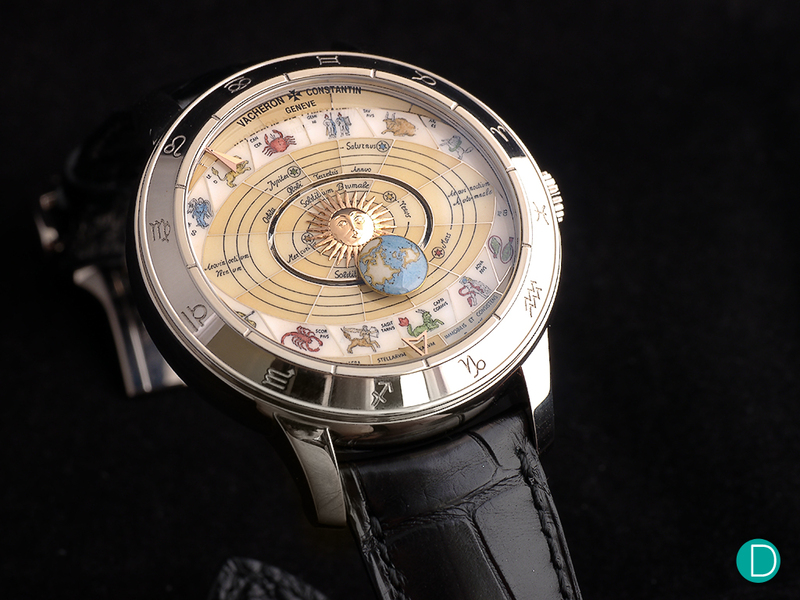 Retail prices are recommended at US$129,600 for Copernicus Grand Feu Enamel, US$98,500 for Copernicus Hand-Engraving and US$88,100 for Copernicus Sapphire. It has been an interesting SIHH. Like in the two years preceding, and perhaps even more so for this year, the novelties are more commercially biased, and perhaps more modestly priced than the decade prior. The decade of 2000 to approximately 2012 saw huge price increases year on year from all brands. Tourbillons seem to be in every catalog when for the prior 200 years these were virtuoso works. And with each appearance, a tourbillon will increase the price of the base watch by a hundred grand. Retail prices above CHF 200,000 were quoted without the slightest embarrassment. Even CHF 400,000 was a relatively common price tag for the more complicated novelties. But for 2017, we see more modest watches. Most tourbillons have returned from above CHFF 200,000 to hover just below CHF 100,000. More realistically priced, we think. More novelties follow the entry level model. No complications, or small ones. Steel cases. Modest prices. Of course some brands buck the trend. Lange and VC are perhaps notable examples. As is Richard Mille. These brands continue to offer megabuck novelties. As does the venerable Greubel Forsey with their Grande Sonnerie weighing in at CHF 1,150,000. Perhaps the industry has come to the realisation that continued escalation of prices cannot be supported by the market in the long term. But more realistic pricing must take its place. The massive consumerism of the Chinese market has ceased, and will not return to the levels we witnessed before. But the market for good, well made, well design and well constructed watches will remain. A more modest and certainly more realistic demand will require the industry to respond accordingly. We predict that in a few weeks,we will see this trend repeated at Baselworld 2017. We live in interesting times. The good times are over. Let the good times roll.